Nike's NFL Uniform Design Change for 2012? Nike’s NFL Uniform Design Change for 2012? It's official, the NFL has release the new NFL Uniform Design Changes. Only thing is, everyone's uniform looks the same EXCEPT the Seahawks. Honestly, I think the Seahawks uniform is P.I.M.P. and I wish the rest of the NFL teams accepted the new Nike uniform designs. As you can see from the links below, the original "leak" was false, would have been cool though! 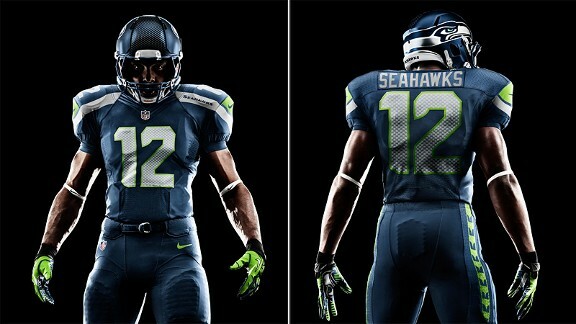 Here is the new and improved Seattle Seahawks Nike Uniform for 2012. My source was wrong about the links below, these were not the proposed Nike Pro Combat Uniform Designs. But still, in my opinion they look to much like arena league uniforms, but apparently these are the designs for the 2012 season. These are not official. I know that owners, GMs etc play a roll in helmet design so I'm almost positive changes will be made there. Regardless, Nike coming into the scene is sure to shake up the design of the 2012 NFL Uniforms. Category - Fantasy Football News and Analysis - Nike’s NFL Uniform Design Change for 2012?